The Ecological Society of Chile (Sociedad de Ecología de Chile) started in July 1978 as the Ecology Section of the Biological Society of Chile, and became formally founded in July 1992. The Society, however, became officially and legally constituted in October 1994 as the outcome of a long process of maturation of the discipline in Chile. In the last twenty years, ecological sciences have experienced a remarkable development in our country, gaining increasing recognition within the Chilean scientific community and incorporating a continuously growing number of researchers educated both in national and foreign universities. Currently, the Society’s membership includes senior and junior scientists, and an important number of graduate students. It is a small scientific community in comparison to the large number of biologists affiliated to other biological societies in the country, but it is composed by highly productive researchers in marine and terrestrial areas. The main goal of the Ecological Society of Chile is to promote and stimulate experimental and theoretical investigations leading to a greater development, progress and dissemination of ecological sciences in our country, and any other activity that results in the benefit of public interests. The Society represents the corporate voice of Chilean ecologists, both at national and international levels. The increasing public concern about environmental problems and ecological topics in Chile pose new challenges for the Society. The recent promulgation of a law addressing the use, management and protection of the environment, and the implementation of its regulations, and also a national policy for the environment will require the rigorous application of ecological knowledge based on proper scientific bases. Consequently, the Society could play an important role both in the development of the more professional aspects of ecology and in fields such as environmental education. An important aim of the Society is to encourage communication among ecologists, mainly through the organization of an Annual Meeting that brings together scholars from different disciplines around the common theme of ecology. The Ecological Society of Chile and its members will welcome formal and informal interactions with scientific organizations from other countries. Former presidents of the Society have been Carlos Moreno (1991-1993), Doris Soto (1993-1995), both from the Universidad Austral de Chile, Patricio Ojeda (1995-1997), P. Universidad Católica de Chile, Mario George-Nascimento (1997-1999) from the Univ. Católica de la Ssma. Concepción, Pablo A. Marquet (1999-2002) from P. Universidad Católica de Chile, Francisco Bozinovic (2003-2004) from P. Universidad Católica de Chile, Julio Gutiérrez from Universidad de La Serena (2005-2006), Luis Conteras from Golder Asociados (2007-2008) and Audrey Grez from Universidad de Chile (2009-2010). Chilean ecologists publish in different prestigious national and international journals. 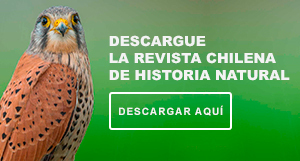 In Chile, the Revista Chilena de Historia Natural (ISI) is frequently used. Also foreign investigators publish in the Revista. Summaries of papers, symposia, and plenary lectures presented at the Annual Meetings of the Chilean Society of Ecology are published in the Noticiero de Biologia.